Earn $6.40 in VIP credit (640 points)What's This? Maxxis' Minion DHR II Wide Trail 3C/EXO/TR 27.5 Inch MTB Tire is ready for duty on the back of your trail shredder. Benefiting from a total redesign, the Minion DHR II sees improvements on many fronts. This Wide Trail version is designed for wheels with a 30 – 35mm inner rim diameter. Featuring beefed-up shoulder knobs that are based on the Minion DHF, but redesigned to be more at home on a rear tire, while the center tread's paddle design assists in braking while rolling smoothly. The 3C rubber compound is long wearing, while still providing ample grip and traction, and the DHR II is tubeless ready for a bit of weight savings and low tire pressures. 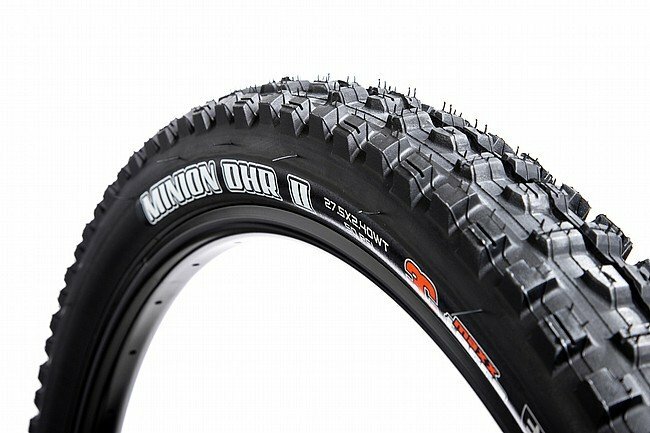 The Maxxis Minion DHR II Wide Trail 27.5 Inch is available in 27.5 x 2.4 Inch (61-584 ISO). For 27.5" rims with inner diameters less than 30mm, the 27.5 x 2.3 inch (58-662 ISO) size is for you Also available in 27.5 x 2.3 inch (58-584 ISO). Claimed weight: 825 grams. Optimized for use as a rear tire. Tubeless ready.